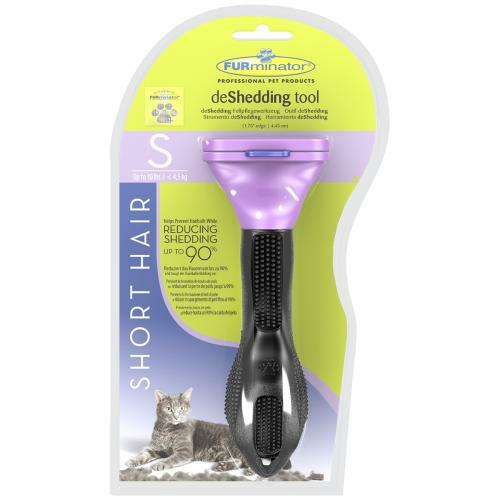 The Furminator Cat Deshedding tool is the safe grooming solution to effectively reduce hairballs and shedding, keeping your cat healthier and happier. It can reduce shedding by up to 90% and is recommended by vets to help prevent dangerous hairballs from developing. Shedding is a problem most cats face and tends to be heaviest in early Spring and early Fall, but indoor cats often shed year-round. Up to 2/3 of the hair a cat sheds is ingested during self grooming, resulting in hairballs that are messy, stressful to the cat and the cause of potentially serious problems. Every loose hair brushed is one less to swallow. Not all cats were created equal, which makes Furminator the best choice when it comes to deShedding solutions. Simply select the short hair or long hair edge tool matched to your cat's body size for a truly customized grooming experience. The design of the edge allows the tool to push through the topcoat to easily and gently remove the undercoat and loose hair without cutting or damaging the cat's delicate skin.